Totally Wired - KLEI gZero20 Interconnects. Cable as a component. Cable as a component - the new KLEI gZero20 analogue interconnect cables. NZ$2500 1m Pair terminated with Absolute Harmony Plugs. The flagship interconnect cable from KLEI - Keith Louis Eichmann Innovations - is a remarkable component in its own right. We say this because in over 25 years of playing and enjoying audio systems both at home and work we've heard very few things that work so well, that are unarguably better than anything we have experienced before. KL (that's Keith Louis as he likes to be called) recently visited us in Dunedin and for the first time we were able to put a face to the voice and e mails of someone we have dealt with for years. He's softly spoken but unendingly enthusiastic about what he does - it really is all about sound quality with Keith and he’s passionate but also continually inquisitive as to what other people think, not just of his products but what they want out of their music systems and how best to make better sound. We like him. The gZero20 analogue interconnect was introduced in January this year (2015). We've already been converted and have various gZero interconnects in our home system - these were the first cables we've found that made enough of a worthwhile improvement over our New Zealand made silver SlinkyLinks to prompt us to change - these were notable for introducing us to KL's very first product - the Eichmann Bullet plug and then making further improvements with the Silver Bullet plugs. Going through the 5 different models of KLEI interconnects was certainly enjoyable and enlightening, but it also consumed a lot of hours and after a while it was nice just to stop and leave our system sitting and play it because we wanted to listen to music, not to analyze the performance of some change we'd made. So for one reason and another, we didn't leap in and get the gZero20s. If coming all the way from Brisbane to Dunedin, you might as well bring something with you and what better for KL to arrive with than a set of the gZero20s. What we heard during a quick listen in the shop was enough for us to say 'yes - we'll keep them' but we admit this was with some hesitation - these are the most costly cables we have purchased. There are considerably more expensive cables out there and we are sure they are just fantastic, but in our world every dollar has to be earned and there are a lot of people out there are finding it tough. Our ideal of audio-socialism where anyone can enjoy great sound with simple well thought out systems takes a bit of hammering once cables like this turn up. But there are some interesting twists to this story so do read on. The KLEI gZero20s do share common ground with the rest of the interconnect range - all feature the new Harmony plugs - which, unless you look closely, all look the same - yet as we learned early on, different materials used in the conductive parts of plugs make for clearly audible differences. There is the Copper (silver plated just to confuse us), Silver, Pure and Absolute Harmony plugs, and it's the latter that feature on the gZero20 (and 10) models. All the cables are comparatively thin and pliant - although once you have a set of 20s in your hand it's obvious that there is more going on in there. When quizzed about what makes the gZero20s better than the lower cost models KL is diplomatically vague - he'll describe it as architecture and while I'm sure I can hear what I'd describe as material differences between conductors the is a bit of neither confirm nor deny going on - although always with a smile. You can’t give away all your secrets. What I do know is that there is something special going on with earthing and it’s a given that the positive and negative runs are different (the 'Eichmann Ratio'). KL makes these cables by hand - he’s got some helpers but the serious stuff is done by himself and a set of gZero20s consume the better part of a day to produce. So the gZero20s have to stand or fall on their sound quality - to most people the entry level KLEI cable looks just the same and performs exactly the same function. The only way to appreciate what these cables can do is in your own system at home. But even before you make that judgement, the question will arise as to if the system actually warrants it. While the gZero20s are new, we've already got a lot of feedback from clients about the gZero10s. And now with our own experience at home we are far better placed to put a worthwhile context in place for you. There are a cluster of high performance high value products in the NZ$2000-$3000 level - the NuPrime DAC-10 and Oppo 105D on the digital front, the Well Tempered Simplex turntable for analogue enthusiasts, Monitor Audio Silver series floor standing and Sonus faber Venere 1.5 stand mount speakers, the PrimaLuna tube amplifiers all being examples. And it's not uncommon for people to own speakers and components well above this level. While it's not the commonly held view, we think that the KLEI gZero20 fit right in to systems from this level and it's their performance that makes this so. The logic is simple - in a great number of systems, the inclusion of these cables will deliver the greatest overall performance gain for the money spent - greater than that of changing other components within the system. The cables are a component in their own right. Consider this - most people will make carefully considered choices when building an audio system - it may well be over many years and the expectation will be that any purchase will last and deliver a real and worthwhile improvement. You'll have chosen components that work with the rest of your system and so there will often be some tailoring of the sound to suit your personal tastes. You could for instance change speakers, but often you'll find that different models and brands seem to have different strengths and the concept of 'best' is difficult to judge. It's swings and roundabouts. Likewise with electronics - power, tonal balance, detail all vary as do features and specification. To find something that is better in every aspect than what you already have can be surprisingly difficult. Our own system is analogue, although don't take this as a particular edict as to what is the superior source. And the components are another level up from the examples we've given above, but just one step. All the same, we don't make changes unless something is better on every front and turntable, amp and speakers have been in place for some years. And we were happy with the KLEI interconnects we already had - between the turntable and phono stage and then another set to our integrated amplifier. From the gZero1 to the gZero10 there are a series of jumps that seem proportional to the difference in cost - roughly $200 between versions. We have also found that with the KLEIs there is a long and profound burn in period that we think makes a bigger difference than that of jumping up a model. The KLEI burn in process is the most unusual we have found. From the outset we were impressed with these cables, but no matter what model, they progress hugely over a period of months, improving in all qualities. It's not that the 'fresh' cables have anything wrong with them. They simply seem to 'fit' much better over time, allowing music to flow through a system so you hear less of the cable as a defined component change and more as a part of the whole. With the lower cost cables, the burn-in is just something everyone goes through. But KLEI do have a dedicated cable 'conditioner' and this gets used - if possible given time constraints on models such as the 10s and 20s. So it is possible to subvert some of the run in process to some extent. When comparing any of the KLEI models with each other, the age of the cable makes an appreciable difference and so has to be taken into account. If comparing KLEI cables to other brands, it's useful to understand what happens with them, but also that the actual character is quite consistent from the outset - and given what we have heard and feedback from clients suggests that once you listen to any model of KLEI there is a certain inevitability as to where you are going to end up. But back to gZero20s - we slotted them in directly between the turntable and phono stage - (our wee system being the Well Tempered Amadeus GTA/Dynavector DV-20X2L, Pure Audio Vinyl Phono stage, Audio Analogue Maestro, Sonus faber Cremona Auditors), the logic being that any improvements made at the start of the chain will flow through (and you can never compensate for losses). We managed to play one LP to let things settle in before sitting down to listen. What Carolyn & I heard was quite breath taking - the inclusion of the gZero20s gave a huge improvement to all the qualities we thought our system did quite well - the resolution of detail off records was easily the best we've heard - individual instruments and lines were cleanily picked out - many that I don't think we have ever heard before. What we thought of as surface noise was significantly reduced - which means it probably wasn’t record noise. Percussion was especially good - the drums on Jakobs wonderful Sines LP sounded far more defined than previously. While we'd found that the gZero6 and 10 models did a lot better in the bass department than the entry level cables, the quantum improvement made by the 20s was a lot more again - our little stand mount speakers were doing things they really shouldn’t have. One of the real strong points of the little Sonus fabers is the ability to project a broad soundstage - the 20s pushed this further than we’ve ever heard, but more importantly populated that space with clearly delineated instruments. If all the detail revealed suggests that the KLEI cables ever get hard or strident you couldn't be more wrong - the sound is as analogue and organic as it gets. David Kilgour's guitar takes on a richness that you only get on the best nights at Chicks - there is a fluidity in his playing that's hard to get across in a recording and the 20s bring this to the fore. Layer over layer of intentional distortion gets opened up till the individual pick movements become apparent. As you might have gathered our musical tastes are not that of conventional audiophiles - we've still got the ability to hear some of our favorite bands live and it's a sound that I've grown up with and know intimately - what the gZero20s do is swing the window wide open in a system to allow you to hear far more of what’s really going on. So what ever you enjoy listening to - that's what you'll hear. There seem to be two parts to the abilities of the gZero20s - they have such a low level of background - some might call 'air' that music seem to effortlessly appear out of nowhere. But listen into that silence and you’ll hear many parts of recordings that simply weren’t there before. It's one thing to have a quiet cable (which the KLEIs are exceptional at) but another to transmit the most subtle elements - in this aspect I've never heard anything to compare. And as we stated at the start - the contribution these cables make is equal to or greater than many component changes you could make - often at a far higher cost. They are not a little better than the gZero10s - they are much better. Yet this difference is completely consistent with the differences between other cables in the range and the dollar cost of each jump. I never thought I'd ever suggest a $2000+ cable could represent value for money, but there you go. Not as flash as a shiny new amp or big speakers to be sure but if you value the quality of what you hear then these KLEI cables might be just what you have been looking for. For any analogue enthusiast the KLEI cables are a perfect match and in the word of serious phono stages, MC cartridges, pre/power amplifiers and matching speakers the justification for the gZero20 is pretty easy once heard. And we are hooked. In the digital world I don't think you have to go nearly as far to reach a point where you are getting close to state of the art, which may make the KLEI cables seem proportionally more costly - our very best DAC (and preamp) - the NuPrime DAC-10 is right up there and only costs a little more than these cables so you might start to get conflicted ideas about what constitutes value for money. Yet in a digital system such as this there can be far few connections and the associated variability. Many digital sources (and analogue even) feed through something like the DAC-10 and so these multiple threads will all be improved. Now we are making sense. Again, it would be easy to spend twice as much on another DAC but possibly get little overall improvement - yet with the gZero20, you absolutely will. Less components simplify choices. 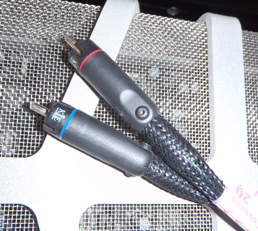 The characteristically smooth sound of all the KLEI cables is perfect with digital - as much as we loved the SlinkyLinks there was the occasional opinion out there that the all silver construction did give a 'bright' cast to the sound and there is no doubt that the bass in the KLEI model is better. It would be falling for cliche to say the gZero20 makes digital sound analogue. But what I think it does do is bring out the very best of the format and takes you places you might not expect. In a very good way. I'm not here to tell you what I think you should hear - you’ll find that out quickly enough for yourself. These really are cables you have to try for yourself. That’s how it worked for us. Exactly the same logic applies to any pre and power combination - it's through this link that everything flows. We've got a lot of NZ made amplifiers out there that are just begging for cables like these - the only alternative route of full amplifier replacement is going to be daunting by comparison. I know from my own experience that cable changes can often be greater than model changes - the original Eichmann AC cables proved this and if you’ve heard these and liked them, we can assure you that what KLEI is doing now is far, far more effective. So here's our conclusion - we've heard and been completely convinced by the quality of the KLEI gZero20 interconnect. If you have invested in a system where many of the components are in the NZ$2000 and above level, then these cables should be firmly in your sights. Not only are they highly likely to be the greatest improvement you’ll make for the amount spent but you’ll also gain more from all the other parts of your system - we’ve gained a new appreciation of the fidelity possible from our turntable, amplifier and speakers and are actually happier with them and now less likely to make component changes than we would have been otherwise. They improved on every aspect of performance and often in a substantial way. Unlike a phono cartridge, cables don’t wear out so these are possibly a lifetime purchase. Given we've never heard another cable with performance that compares with the gZero20's immediate and obvious superiority, it's a fair assumption that nothing better is going to come along in a hurry. Virtually all audio components utilize RCA connections so even if your system changes, it’s highly likely these cables will remain as a critical link. If any component at the same price as these cables made such a big improvement it would be a complete no-brainer. If sound quality is important to you, these are one of our very best recommendations - they are hand made, the result of a lifetimes work and some really inspirational thinking. And they are easy to try - just plug them in. Why not balanced? A large part of the KLEI cables performance is due to their plugs - many other specialist cable designers are already starting to use these because it’s obvious they are something special. And there are clearly audible improvements made by stepping through the range of 4 plugs so the gZero20s start with a considerable advantage. Virtually no other cable brands build both cable and plug and its reasonable to think that KL's design is unique. Would an off the shelf balanced connector sound better? - the design of these plugs is an antithesis of the KLEI approach with heavy metal bodies, little attention to metallurgy other than physical strength given their intended application in PA systems. While there is a theoretical advantage over the standard RCA cable in terms of shielding and grounding, the KLEI approach is far from standard. The remarkable noise rejection of the KLEI cables means the whole rationale for going balanced over single ended isn’t a requirement. So even if you have already made a commitment to balanced cables, don't assume that the KLEI gZero20 (or in fact any model in this range) isn't for you. If you have gone balanced, the reason is to get better sound and less noise. If the KLEI RCA terminated cables deliver this and a considerable performance advantage you owe it to yourself to have an open mind and open ears. We are also still getting to grips with the KLEI speaker cables. The nature of their construction is similar to that of the interconnects and means that there are no economies of scale with going longer - if you want twice as long, this will cost roughly twice as much yet still sound just the same. A 1m interconnect is sufficient in almost all systems but speaker cable length requirements are far more variable. So the value for money equation can be quite different from that of interconnects. Everything we are hearing suggests the best strategy is to improve interconnects first and look at speaker cables later - the better the sound you have running into them, the better the sound out. 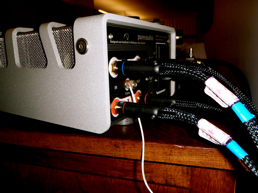 Even with these considerations, we are now choosing to use the KLEI speaker cables as our default in all serious system demonstrations - we haven't sat down to analyze how they compare but even our entry level systems seem to be much better sounding these days. For simpler and lower cost systems, the gZero20s will still yield remarkable results and if you do intend to progressively improve the system, they may well be a consideration. There are some supposedly entry level components that have real musicality and because they can often be simple in design and moderate in power, there is very little between you and a recording. These cables will enable such components to perform well above expectation. But you may also wish to consider the lower cost cables in the same range. While we haven't made a big thing of it, the construction of the gZero20 is internally different to the original KLEI cables we introduced last year and some of the elements of this have been quietly introduced to the whole range - this did result in a price increase although we feel the performance gained more than justified it. This also made it possible to release a new entry level cable - the gZero1, which makes the KLEI sound accessible to almost everyone and in itself is a great sounding cable that handily outperforms anything else we have heard at twice the price. If comparing the gZero1 to any conventional cable set, many of the same things we have said about the gZero20 apply - there will be more detail, a broader and more defined soundstage, lower noise and a more organic and easy listening sound. If you’ve never listened to serious cables before, what you hear from the gZero1 may be as much a revelation to you, as the gZero20s have been to us and there is absolutely nothing wrong with staying at this level. The socialist in me wants everyone to be able to enjoy music to the level possible with the gZero20s but until that day arrives, the lower cost KLEI cables - all hand made, all with variations of the Harmony RCA plug, all with a common architecture, low noise and characteristic organic timbre, will allow you to choose the level you are happy at. If you are lucky enough to be able to afford the gZero20s they are quite simply one of the very best investments in audio we have ever heard.